I’ve got a new website and I’m moving the blog over to it to keep everything together in one place. I’ll leave this one up for a while for reference and the calendar should change automatically. Visit my new home http://humboldtbeerworks.com/humbrew-nation/. 1:11 Fazios stuff is dank. 1:18 Wild Golden Ale on Black Currant Aged On Oak. WGAOBCAOO for short. 2:25 Competition is tight this year. Phenomenal beers. Everyone trying to outdo the next guy. 2:36 No that pitcher of homebrew is not a dump bucket. 3:13 The quality of beers this year has surpassed previous years. Currently enjoying Ari Friedman’s 4 year old Kriek. Absolutely amazing. 3:28 Everyone is taking about Jamie’s Bourbon Barrel Aged Stout on Nitro and Ari’s WGAOBCAOO. 4:22 More beer this year but about the same amount of attendees. 4:34 I’m calling it a day. Epic event. “How hard is it to brew?” That’s a question I’ve been asked I don’t know how many times. My canned answer is “Its like making soup. You follow a recipe.” Of course, there is more to it than that. Much of it is what you do after the brewing is done. Sanitation and fermentation are the other areas to really focus on and don’t need a whole lot of instruction, but I will touch upon them. Brewing and the art of beer making can be very intensive and ever-evolving. You can go nuts if you want to. Below is a jumping off point to give you an idea on what it takes to start. Nobody starts out with a “Pliny The Elder” quality beer on their first batch. Like anything, you have to learn to crawl before you can walk. You will also need a stainless steel kettle that is at least 7-7.5 gallons. Some people start out with smaller kettles. Its good to start out with this size from the beginning if you can. You will probably eventually upgrade anyway. 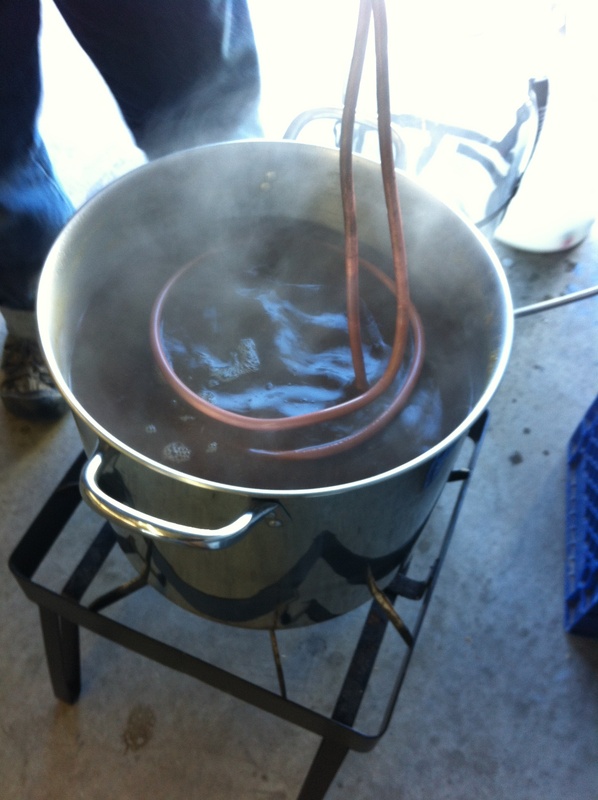 You want a bigger pot so you don’t have to make a condensed wort. Homebrewed beer recipes are usually made to 5 gallons. 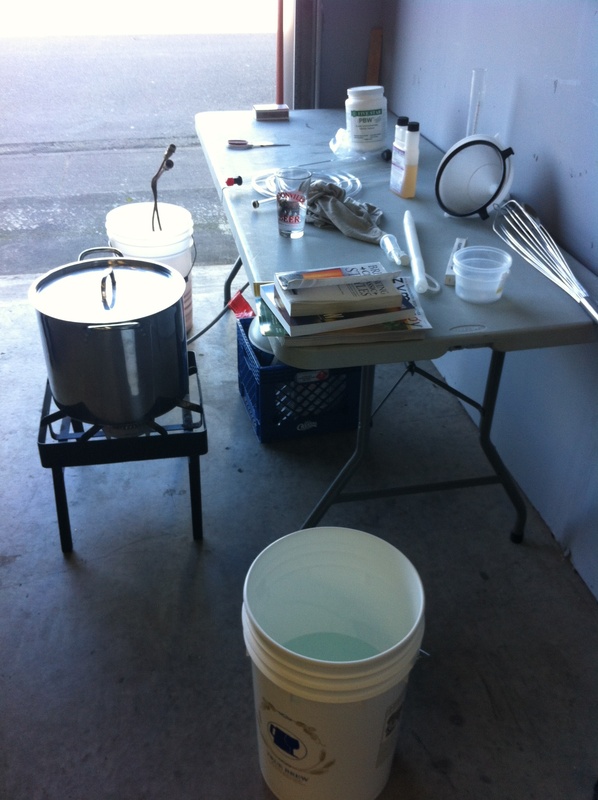 Most equipment, especially starter equipment is scaled for 5 gallon batches. So why not start with a 5 gallon kettle? Well, you can, but its better to do a full volume boil rather than a partial boil and topping it off with water in the fermenter. Often times, you will see beginner instructions teach this method. You need a bigger kettle so you can boil a full 6-6.5 gallons of wort. After evaporation and trub loss, you should land around 5 gallons. Doing it the other way, you often end up with 3-3.5 gallons of wort and you are “topping off” with clean water in your fermenter. In doing this, you will have a caramelized flavor (extract twang) and your hop utilization will be off. Malt: This will be providing all the fermentable sugars that the yeast is going to feed upon. All alcohol gets its fermentable sugar from some source or another. Beer just happens to come from malted barley. Hops: These are actually flowers from a vine and provide the bitterness and some aroma in the beer. Adding hops to the boiling wort (and sometimes before and after the wort is boiled) at different times imparts bitterness, flavor and aroma. Water: Beer is mostly water and can often be a signature to a beer. It is often the reason why styles emerge out of certain geographic areas. For example, the soft water of the Pilzen region in the Czech Republic is ideal for pale lagers and that is what the region is known for. But it wouldn’t do well for English bitters, who’s water tends to be harder and the beer styles that have emerged from there are tailored to that type of water. Yeast: These are the critters that eat the sugar. The by-product of this is C02 and alcohol. When the yeast gets to work, they warm things up a bit and multiply. Now that we have everything in place, we can brew. Keep in mind, lots of step by step instructions very just a little bit and this will be no different. Most follow a basic process so don’t let the different nuances bother you. Collect your 6.5 gallons of water and heat it to about 160 degrees. 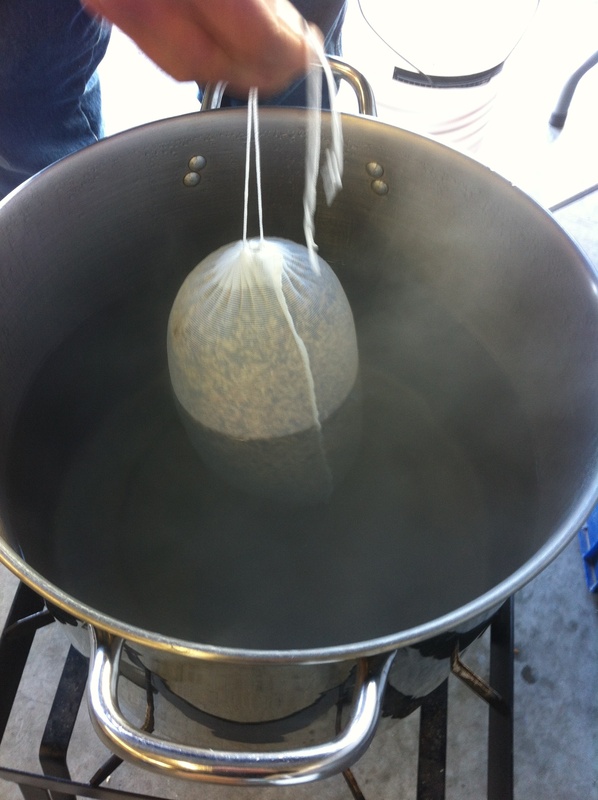 Then add your steeping grains in the steeping bag and hold that temperature for about 10-15 minutes. At the end of that time, remove the steeping bag and let it drain. Resist the urge to squeeze it. This will just extract some unwanted tannins. Turn up your heat and bring the water close to a boil. Turn off the flame then add your malt extract. If you add the extract with the flame on, it could scorch on the bottom of the kettle. Turn your flame back on and bring to a boil. Once you are at a boil, that begins your 60 minute countdown timer. 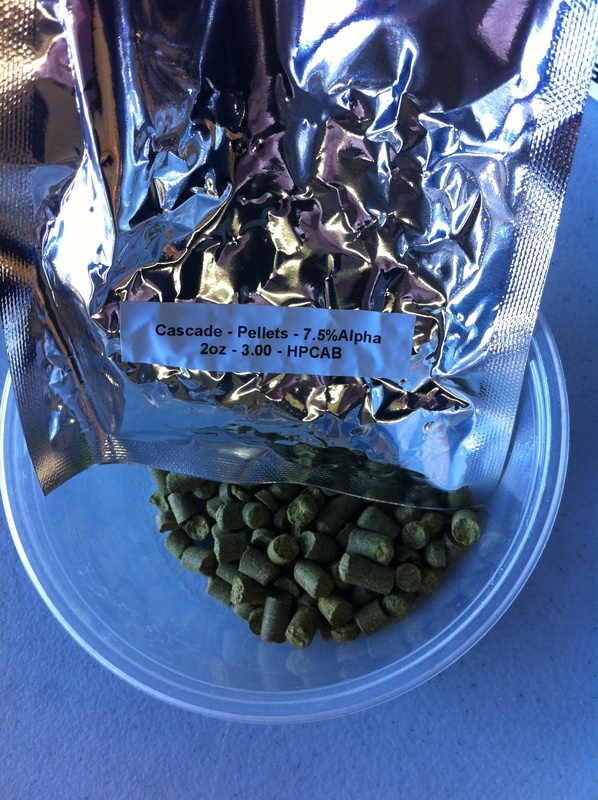 Your recipe most likely has hop additions with times noted beside it. If your recipe has a 60 minute addition, add them now. These hops will be providing the bitterness. Hops added later will be geared more towards aroma. Some beers like stouts and wheats have a bitterness addition only. These beers aren’t known for hop aroma. An hour has passed, and you have added all the hops according to your recipe. Time to chill the beer down as fast as you can. The moment you turn off the flame, everything that touches the wort needs to be sanitized. Most beginners start out with an ice bath to chill the beer down. That method can take a few hours. Its ok, but you want to get the wort down to 65 degrees as soon as you can so you can add the yeast. Its important to get the fermenting process happening as soon as possible. The quicker alcohol is present, the less chance of infection. Don’t let that scare you. Basically, get the good bugs going before the bad bugs take hold. Chilling can be done by using a copper immersion chiller that you run cold water through. And sanitizing the chiller is as easy as dropping it in the wort with about 15 minutes left in the boil. Pause the timer until it comes back to a boil. Now that the wort is chilled to about 65 degrees, you can transfer the wort to a sanitized fermenter. Making this process as vigorous as possible is good. Aerating the wort is important for shorter lag times (time between pitching the yeast and fermentation starting). If you put the wort in a glass fermenter, this may actually knock off a couple of more degrees. Add your yeast, affix a stopper and airlock and you have just made beer. Most ales will need to ferment for about 10 days. In the correct environment, most of the fermentation is going to be done in the first few days but you really want it to sit undisturbed for about 10-14 days. But disclaimer here: Fermentation doesn’t have a timer. Let your hydrometer tell you when its done. Lagers have a much more intensive fermentation schedule and I won’t even get into that in a beginner focused blog post. Of course, there are a tons of variations in processes, methods, ingredients etc., and it does get much more advanced if you want it to be. This is a basic rundown of what you can expect on your first brew day. Everyone evolves their own style and that’s the great thing about homebrew. 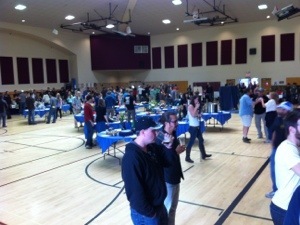 If you want a good example of the wonderful variety of the world of homebrew, you should consider attending the 2013 Humboldt Homebrewers Festival, April 6th at the Arcata Community Center. Oxidation. Typically, that’s an unwanted effect in your finished beer. This is true for most beers, especially in lighter style beers, but in sweeter, heavier and higher alcohol beers it can have a sherry like element that is desirable and is most prominent in old ales. One award winning homebrew I tasted was a porter that was just old, but time and conditioning had transformed it into a beer falling squarely into the old ale style guidelines. This is something that is achieved simply by aging the beer properly but if you crack open your latest homebrew and taste paper or cardboard, you have introduced a significant amount of oxygen into your beer post-fermentation. One time while trying to diagnose a faulty beer over the phone, I inquired about the brewers process and he stated he “poured” the fermented beer from one bucket to the next. That was all I needed to hear and I knew exactly what the problem was. Read this paragraph understanding that oxidation can be good and bad, but mostly bad and it depends on how you go about getting an oxidized beer. Lets stop for a minute and talk about the difference between oxidation and aeration. Aeration is something that should be done to your wort pre-fermentation and before you pitch your yeast. 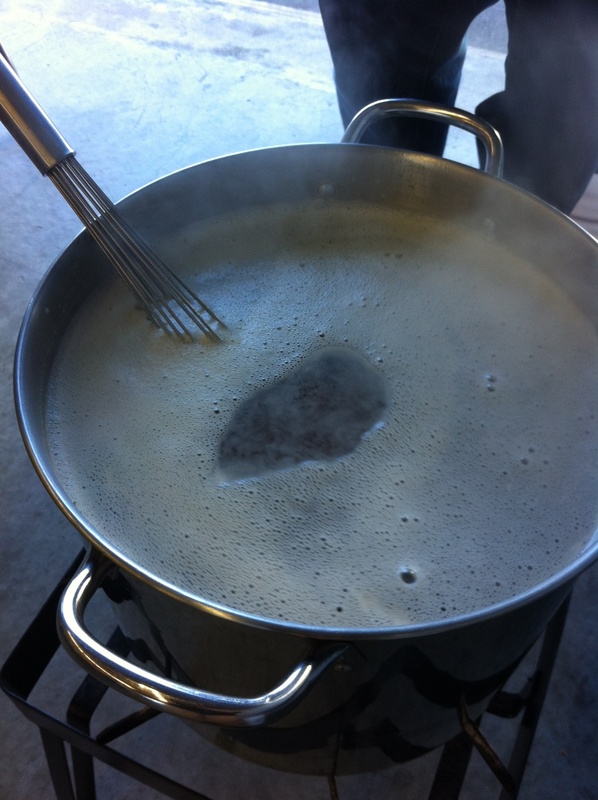 The act of boiling your wort has pretty much devoid it of oxygen and your yeast needs oxygen to quickly begin their job, build healthy cell walls and reproduce. Somehow, you need to reintroduce oxygen into your wort. 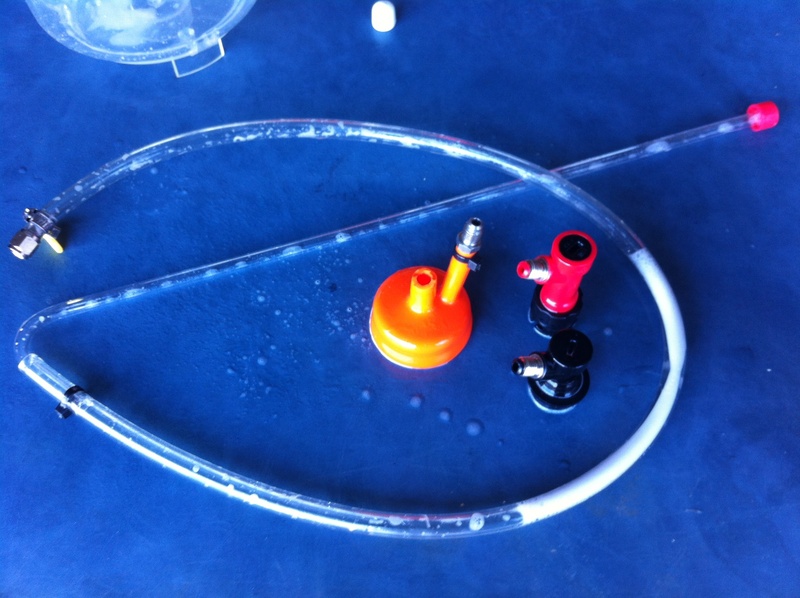 This can be done by capping and shaking your fermenter or directly injecting filtered air from some kind of air pump (aquarium pumps are pretty popular for this) or filtered oxygen. Both are best dissolved through an aeration stone into the wort. Aeration results in shorter lag times between pitching the yeast and the first signs of fermentation. I actually end up aerating my wort twice, once by creating a whirlpool in my kettle to isolate cold break and then once more with pure oxygen. This could be overkill. I’ve never had it tested in a lab but my beer turns out pretty good so I’ll keep doing it. Oxidation occurs post-fermentation, usually due to sloppy racking and splashing the beer. Think of oxidation as rust on metal. This can also bring on spoilage. 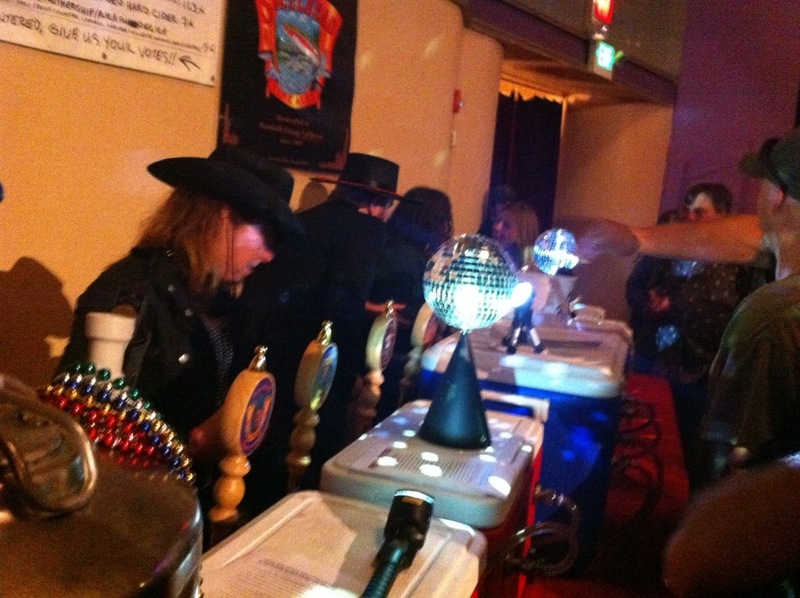 Have you ever poured beer from a keg that has been dispensed from a hand pump? The keg is being pressurized by atmospheric air. That’s okay for a day or two, but beyond that, the beer will taste spoiled. Therefore, transferring your beer under CO2 pressure into vessels purged of oxygen is one more way to improve the quality of your beer. Probably the biggest downfall of this is process is the use of CO2. Its not always cheap. And if you only have a small 5 pound tank you know how fast you can deplete it. First of all, the most PSI I have used is 2. I’ve heard of people doing 3 to 5 PSI and the transfer process is faster. I’m a little too scared to go above 2 PSI and beyond that with my system its a waste of CO2 anyway. I’ll talk more on that later. So know your PSI limitations before you attempt this. Note: barbed fittings may vary based on your tubing size. I like a zip tie for this because I feel by having a loose connection here and by not clamping down the carboy cap onto the carboy, it sort of makes for a built in pressure relief system. When I have this operating, I can hear pressure escaping. Its wasted CO2 for sure, but I like it for safety reasons as well. Next, insert your racking cane into the carboy cap. Connect your tubing and flare fitting so you can connect to a corny keg quick disconnect. 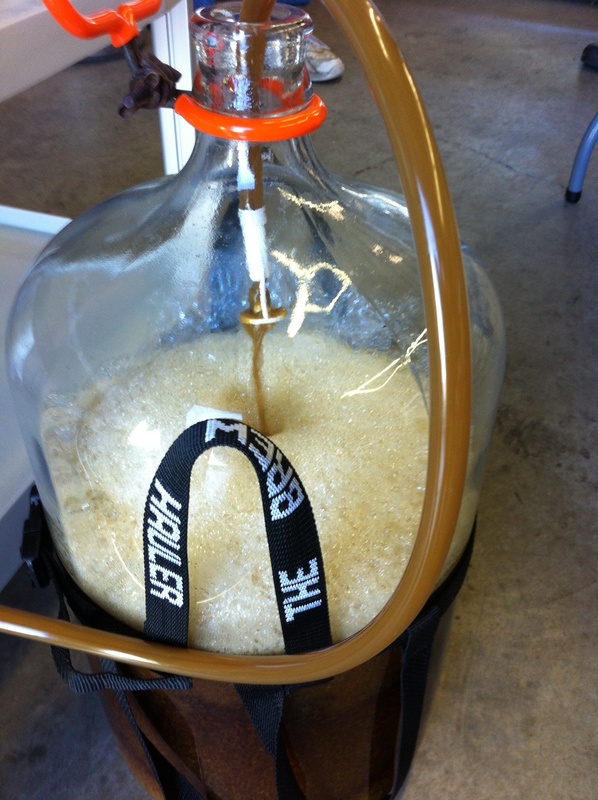 Attach your appropriate QD and fix the entire assembly into the carboy so its ready to rack. Purge your keg with CO2. 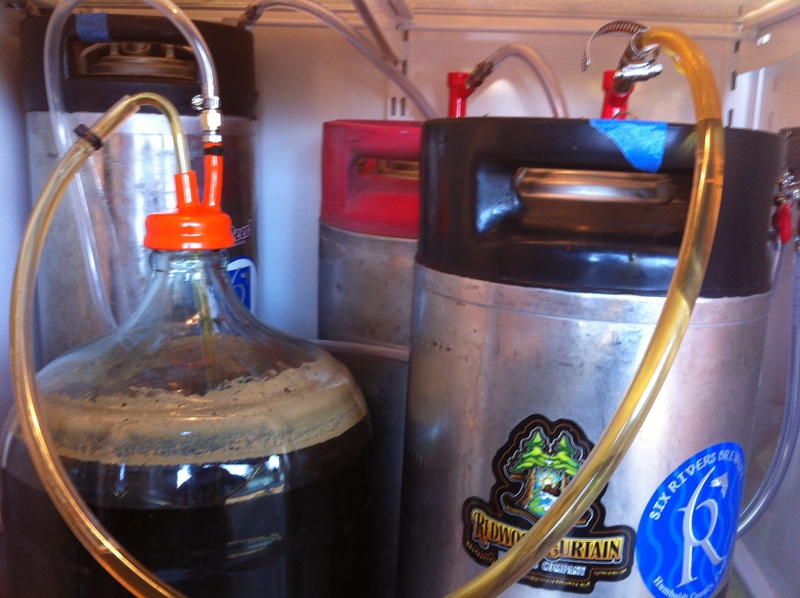 Do this a few times and bleed off the pressure to make sure all the air that’s in the keg has been replaced by CO2. Fill it one last time with CO2 a little bit. When you get ready to connect to your keg, open the pressure relief valve and turn it (or flip it for some) so it remains open. Connect to your beverage out post on your keg. Although this is the outlet, you will be putting the beer in through the dip tube. By now, everything is assembled and connected and ready to add CO2 pressure. It would be wise to have your pressure set beforehand instead of accidentally blasting it with some sort of dispensing pressure meant for kegs. Remember, aim for 2 PSI MAX! 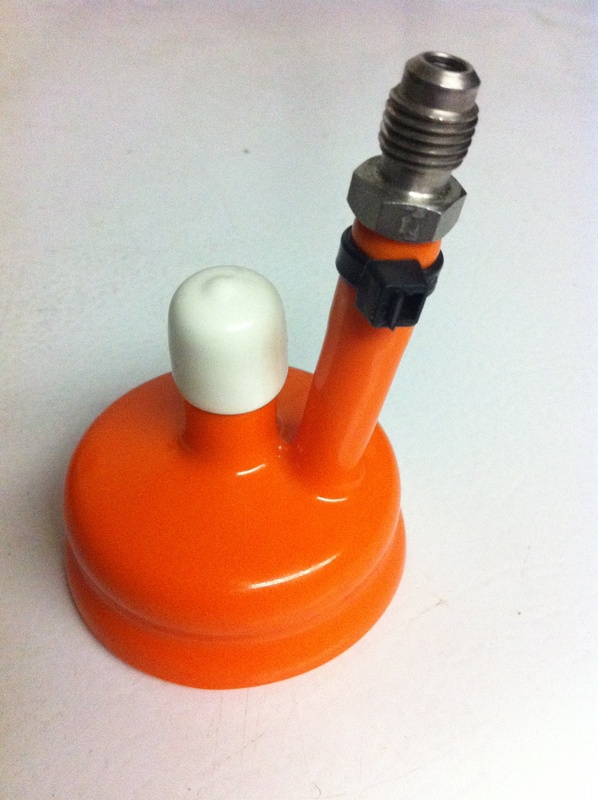 Your CO2 system is attached to your carboy via the carboy cap. The racking cane is attached to your keg OUT post. Your keg is purged with CO2 and pressure relief valve open. You are ready to add pressure. I still get a bit nervous pressurizing a carboy. In reality, the really stout ones can probably take quite a bit of pressure but in the back of my mind, I’m prepared for it to shatter and spend the next hour mopping up beer off my garage floor with a gigantic glass shard protruding from my torso. Please, please, be careful if you try this and don’t jack up the PSI unless you are prepared for a catastrophe. With my CO2 system being fixed the way it is having the gas lines going through the wall of the kegerator, I’m forced to do this with the door open if I want to have gravity assist the transfer effort. I tried that method and also having the keg level with the carboy and I didn’t notice a difference in time to rack. So the big benefit for me is I’m able to close my kegerator and let the magic happen. If the carboy explodes, then I will have a mess but the danger is contained. In summary, please be careful. I can’t stress enough that things can go wrong and you need to understand I’m in no way saying you should do this or follow my direction. I do it and it works for me. Your mileage may vary. Also, understand that you are going to be wasting CO2 you will never see again. But in all honesty, I waste 10 times more CO2 pushing cleanser and sanitizer through my draft lines. My next project is to figure out draft line cleaning with compressed air, so at the end of the day for me, I will be ahead of the game for saving CO2. As a homebrewer, you can achieve everything that craft breweries achieve. You just have to think in the small scale and work within the boundaries and equipment you have. Almost every craft brewery started in the home with people doing things like this. And I can tell you with absolute certainty, most of the brewing innovation these days is happening in the home. Don’t be afraid to dream big and brew small. For years, I’ve been searching for an Irish grown malt. I never really cared for English malt because it was too bready and biscuit like for my taste. In fact, I’m not a fan of English ingredients entirely, so if you know where to get Irish grown hops, let me know. Occasionally I would do a Google search, get two or three pages deep, click onto a few leads and get nowhere when it came to availability in America. I conducted one such search in late summer 2012 and finally saw two names on one page that stopped me dead in my tracks. Malting Company of Ireland and Brewers Supply Group were staring at me in the same sentence on a global commodities distribution website. Brewers Supply Group is my malt supplier. I immediately sent an email to my supplier. “Yes,” was the reply, “we have the stout and lager malt available in our California warehouse.” I got the spec sheets and the stout malt was a light lovibond and it didn’t look like there were any problems with using this malt in a lighter colored beer. In fact, this malt, by the numbers, is very similar to Golden Promise. The low protein and high extract had me dreaming of making IPA stand for “Irish Pale Ale”. The sack of malt came in with a delivery and I took it home. Due to the madness of moving Humboldt Beer Works, I didn’t get a chance to brew with this malt until Veterans Day. The week before, I ran into Peter Hoey of Brewers Supply Group, formerly of Bison Brewing and we ended up going to Strange Brew together that day. He said this was some of the best malt he has ever seen and was hoping to brew with it soon. I had originally planned on doing a pale ale, but after speaking with Peter, I changed my mind to a SMaSH beer, single malt, single hop. Since this was such a new (perhaps, unproven) malt, I wanted to see what it could do on its own without interference from color or roasted malts. Also, since I’m such a fan of Anchor Steam, my go-to dual purpose hop is Northern Brewer. Deciding my recipe was done. 100% Malting Company of Ireland Stout Malt, Northern Brewer hops all around to 25 IBUs and of course, Irish Ale yeast. I adjusted my recipe to give me an OG of 1.052 and proceeded with my brew day as normal. I should have known something was wrong –or right– when I took my pre-boil gravity reading and it was 1.052. My pre-boil was my target original gravity. I needed this measurement to figure out my efficiency. Assuming 35 points of extract –which is fairly average for base malts– I had achieved 95% efficiency. If this malts point value is closer to Golden Promise, my efficiency only drops by 1%. I was so stunned I took two different samples and my results were the same. Regardless, I extracted a lot of fermentable sugars out of the grain. My original gravity ended up at 1.058. I fermented with Wyeast 1084 at 62 degrees. The beer finished at 1.009. I was hoping for something more session strength and landed at 6.4% ABV. I did not secondary. I kegged up the beer and finally poured a draft. What I tasted was a well rounded, full mouthfeel beer. Despite finishing on the dry side, you could not tell. This beer was still malty and didn’t taste dry at all. I didn’t achieve good clarity, but I wasn’t trying either. I happened to run out of Whirlfloc so I used no finings, I didn’t cold crash and I didn’t secondary. It produced a wonderful, pillowy head and was all around delicious. In the foreseeable future, I don’t plan on using any other malt. I’m going to continue on with my pale ale idea, but now I’m beginning to think this malt would make a fantastic barleywine. So I’m considering both in a partigyle batch. Almost every style of ale with this malt is begging to be tested out. 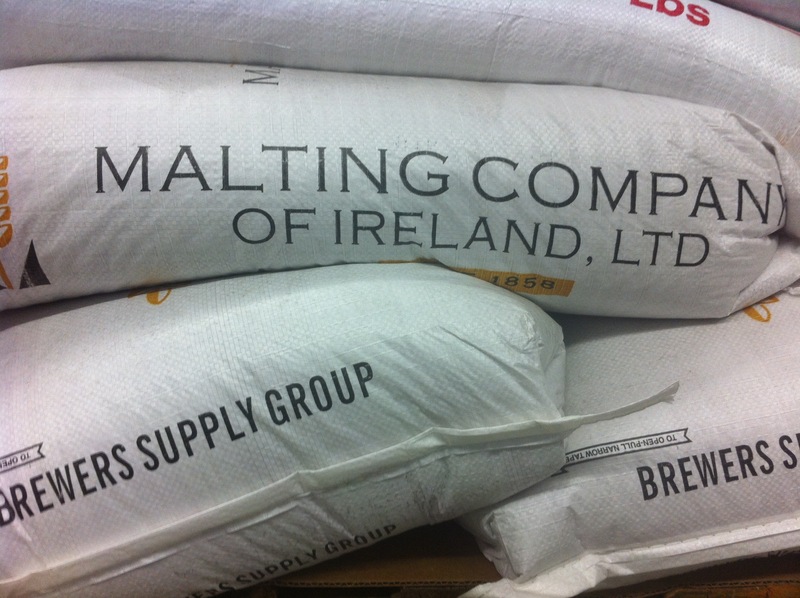 Malting Company of Ireland makes lager, stout, ale and distillers malt. The stout malt is available at Humboldt Beer Works now. Silence. Processing. “Uh, what?” was my dumbfounded reply, still trying to figure out who I was speaking to. I obtained an email address of the editor of the Northwest Brewing News, Alan Moen, and fired off a query. Yes, sure enough, we won. As did the Local Beer Bar for Best Nor Cal Alehouse/Pub and Best Nor Cal Beer Store and Redwood Curtain Brewing Company for Best Nor Cal Nano Brewery. I know what you are thinking on that last one. Humboldt Beer Works spent most of this voting year in a small space that was less than 300 square feet. But by golly, we packed that place with everything you needed to brew. Our goal was to move into a bigger space within a year, and we did it in the 10th month of operations. 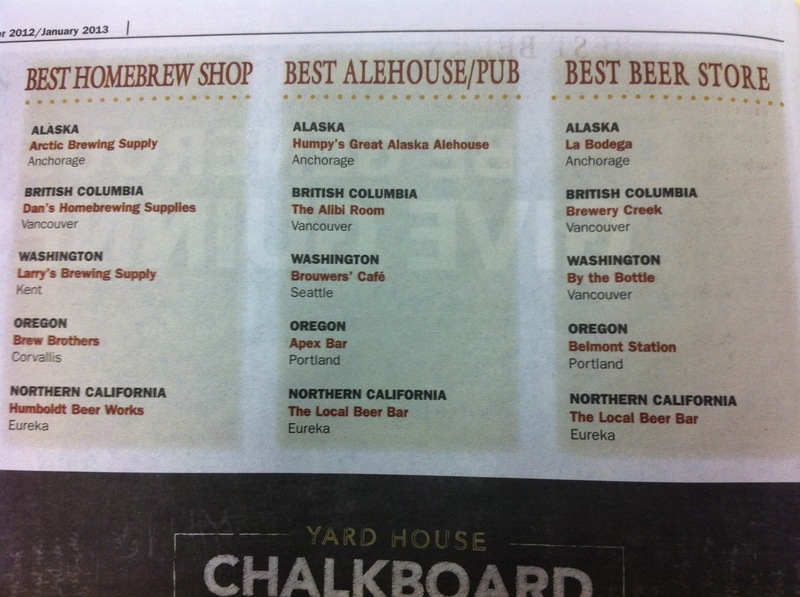 We quadrupled our size and expanded our offerings and couldn’t have done that without all of you and many of you voted. Thank you. The Local Beer Bar opened in March of 2012 and instantly, owner Darren Cartledge put himself on the map as a beer destination. He cut his teeth at Blondie’s Food And Drink in Arcata and hit the ground running with The Local. One of the great reasons to visit The Local is that you can go two days in a row and the beer menu won’t be the same. There is never a shortage of interesting beers at The Local, both tap and bottle. This award is well deserved. 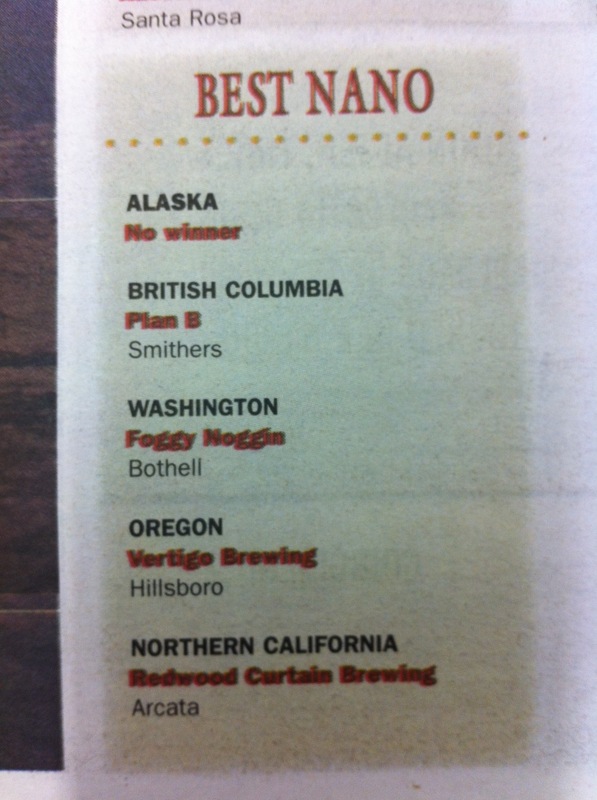 Another well deserved award, albeit misguided, is for Redwood Curtain Brewing Company. But lets make this clear, Redwood Curtain is not a nano brewery. Not even close. 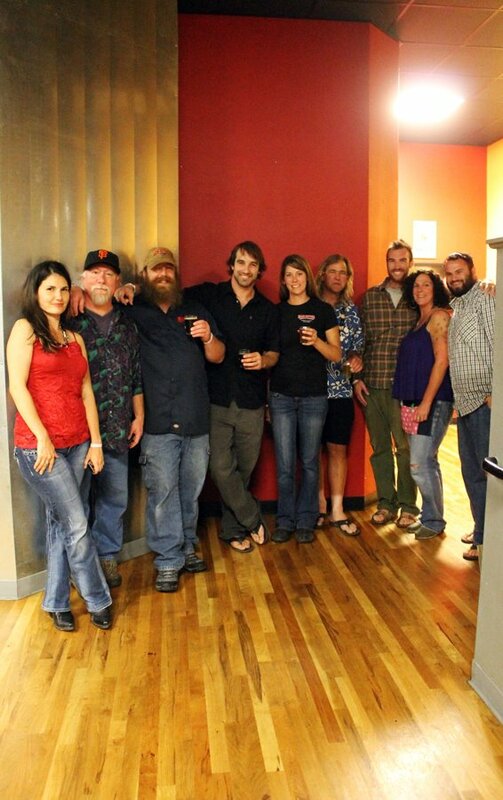 So you have heard the 2012 story of Humboldt Beer Works and The Local Beer Bar, now hear Redwood Curtains 2012 story. Actually no, the ugly part doesn’t need to be retold. The brewery operated previously as a partnership in the beginning of the year and in August, a sea change forced owner Drake Mollberg to take the helm. But that wasn’t all. This sudden transformation punched Drake right in the face during a brewery expansion and the impending birth of his child. All at once, his life got very multi-faceted. Not only did he become sole owner, but he took on all the brewing duties. So I hereby rename Redwood Curtain’s award to Best NorCal Brewery Owner, because Drake truly deserves it. I’ve been singing this song for a year. Humboldt County is a craft beer destination in the making. Here’s proof. It was one of those ideas that a homebrew club lives for. But it was certainly not a new concept for homebrewers. We hatched a plan to brew up a bunch of beer, in this case 20 gallons, and dose each gallon with a different yeast. We didn’t make it to 20 different yeasts but enough to make it interesting. And in January, we plan on getting together and tasting them all. One of the primary goals of a homebrew club should be education and this was great education in yeast and how important of a role it plays in beer. 10 brave souls with 13 different yeasts in hand endured one of the worst days of weather in Humboldt in 2012. But no matter, the testing ground was Heatherdowns Brewery — uber geeky homebrewery approaching nanobrewery owned by uber geeky homebrewer approaching nanobrewer, Jere Cox. Jere is one of those guys who became introduced into homebrewing with a gift from his wife for Christmas years ago. Little did she know that he would go nuts and fill their garage with a monster stainless 20 gallon system and externally heated/cooled conical fermenter. We are ever in her debt for that wonderful gift. The base beer was a simple blank slate, which was important in this experiment. 100% pilsener malt, Magnum, Santiam and Tettnanger hops bittered to about 25 IBU’s and an anticipated ABV at just over 5% — but that will vary based on the yeast and fermentation handling by each participant. The baseline beer was going to be Jere’s made with Mad River Brewing’s house strain which lends itself to crisp and clean finishes. All other strains will be compared to this. Each participant agreed to maintain the proper fermentation temperatures to the best of their ability. Yeasts were pretty well matched to their handlers — from the most demanding yeast going to the most experienced brewer and the most forgiving yeast going to the newest brewer. Late fall/early winter brings the mildest of mild temperatures to Humboldt, so the timing was well chosen. Is your mouth watering in anticipation? It should be! Side by side comparisons of one beer with only one variable changed is one of the best ways to train your palate. It doesn’t matter if you want to be a better brewer or a better taster, this is an experiment for you. How can one taste them all? It would be easy to tell you when and where. Instead, I will send you in the direction of the Humboldt Homebrewers — let your adventure begin there. November 3rd was a great day for craft beer in my little world. 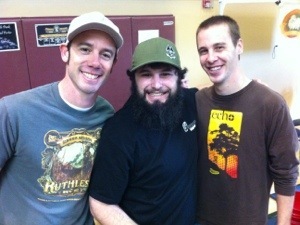 The day started off with Learn To Homebrew Day by the Humboldt Homebrewers and hosted by Humboldt Beer Works. About 8 people took the leap in to learning how to brew their own beer at home which is probably one of the most rewarding hobbies there is. 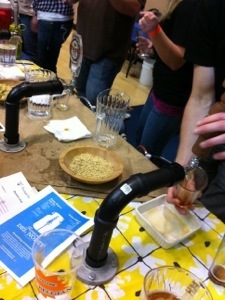 They also got a demonstration on how to make a yeast starter, which will be a future post here at HumbrewNation. Partway through the demonstration, I turned my attention to someone who I perceived as needing help, and he turned out to be one of my supplier reps, Peter Hoey of Brewers Supply Group, formerly of Odonata Brewing and Bison Brewing. Peter was pleased to see us hosting a Learn To Homebrew day, which he claimed was not common at a homebrew supply store. 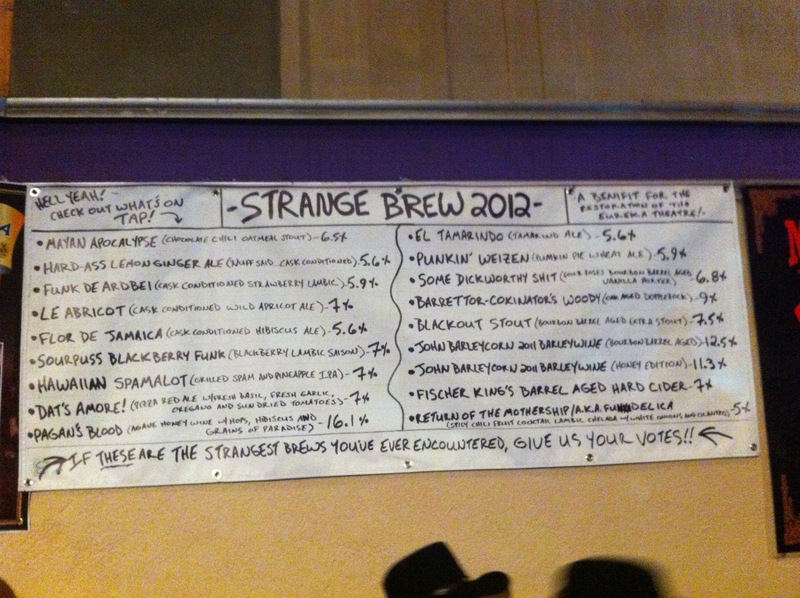 I’m going to announce my awards in a minute, but first, extra stroke for the Strangebrew folks and their mission. There is nothing better than drinking craft beer for a cause. 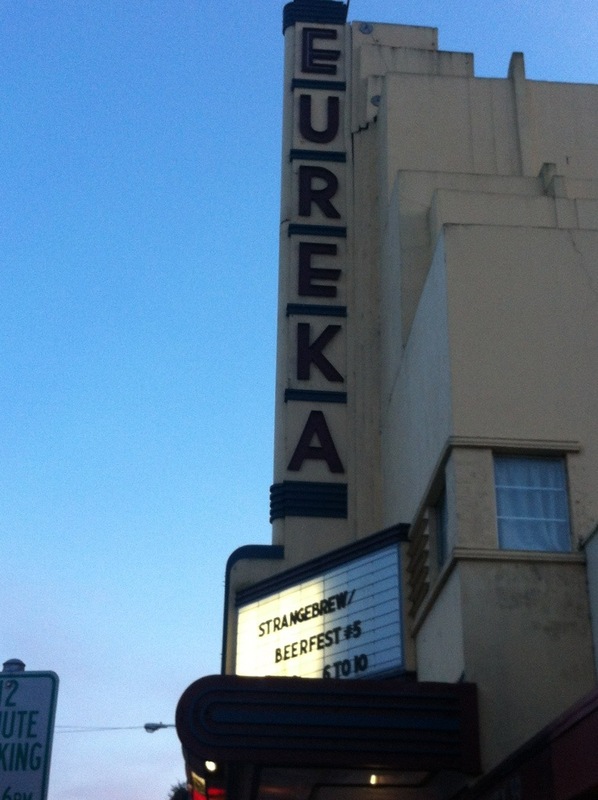 And this cause is for the restoration of the Eureka Theater and the bigger picture is promoting art and its many forms. The Eureka Concert & Film Center is dedicated to the education of the general public in film, theatre, music and other art forms, rehabilitating and maintaining its historic facilities for instruction and public performances, displays, exhibits and other events. They actually manage several events throughout the year. Check out their website. Best Beer With Wormwood: Humboldt Regeneration with their Absinthe Wheat Wine. Best Beer That Doesn’t Exist: Marshmallow Kiwi Corn Flake Witbier by….. I forget who. Yes, Mad River is represented very well in the FAHAFTFASB and that’s probably due to the fact that they came with the most variety. Their booth alone probably had almost half of the Strangebrew 5 offerings. You can tell Dylan Schatz and his crew are thinking about Strangebrew all year long. Their Strangebrew beer ranged from fairly normal one-offs, to interesting beers from funkytown all the way to beers with ingredients that had absolutely no business being in beer. But that’s the great thing about beer. 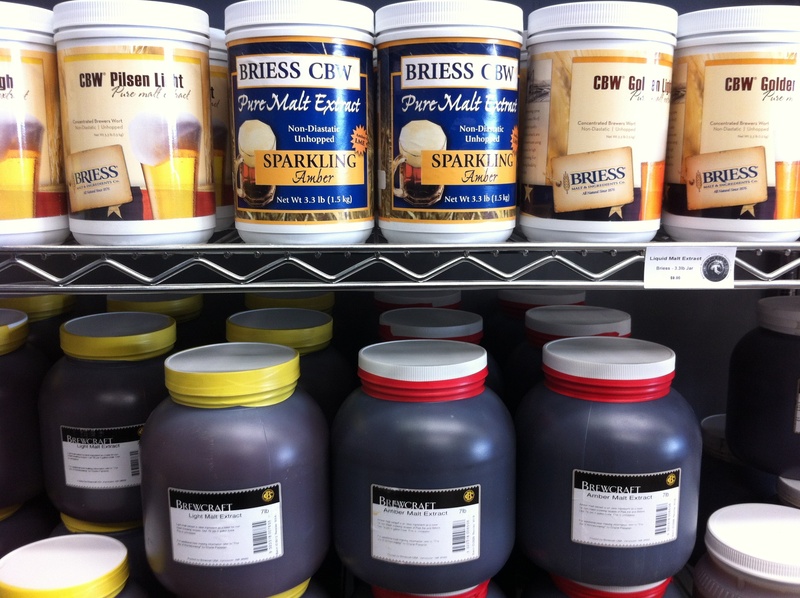 You can put almost any consumable product in it and at various stages in the brew process. Some are winners and some are stinkers. Rumor has it that Oskar Blues was very interested in coming to Strangebrew and there is a wide ranging interest in it from several out-of-the-area breweries. But the floor of the theater with seats installed is a very small area and it was pretty full as it was. I’m not sure how many breweries it will take (and an increase it ticket sales) before the Strangebrew folks give in and manage a bigger venue and festival. Thanks to Sonny and the rest of the Strangebrew crew for all their hard work. And congratulations to the award winners. Please don’t add them to your list of awards you actually brag about. Short post. The results speak for themselves. Support your local brewery. It means everything. Tags: Eel River Brewing Co., GABF, Great American Beer Festival, Mad River Brewing Co.
As September wore on, Humboldt Beer Week approached and in my head, I was thinking of all the blog material I was going to have when the dust had settled. But when the first beer was poured at F Street Beer Fest, there were some 35 individual events happening in the coming 9 days. Although it might be possible for someone to attend all or some of the events and blog about it, it certainly wasn’t going to be me. Then I thought I would blog about events I attend. No, that’s a bit scattered. I like to think I know everything going on in Humboldt County beer-land and I want to be there for everything, but my wallet, liver, family and work cannot handle it. Besides, the timing is just plain bad for me. I will tell you more about that later. 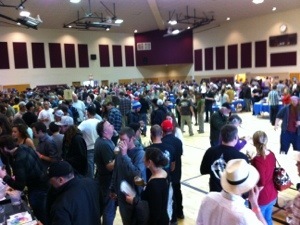 Yes, I admit, your Humbrew Nation blogger cannot be your reporter on the scene for everything Humboldt Beer Week. But I want to be. Dearly. Although the basis of this blog is “This happened here, and I drank this beer, it was good, and this is something you may not know”, I will do that and have, but I have to mix it up from time to time. So I decided to bring you the story of Humboldt Beer Week, it’s inception, its effort, where its going and where it should be headed. Humboldt Beer Week isn’t so much about one event or one effort behind one event (say like Hops in Humboldt) but more about coordinating the local breweries and craft beer providers to doing special events at one time. They can be, as you have found out, festivals, special beer releases, food and beer pairings, pints for non-profits, and themed beer nights. It is simply people asking these places to have special events during Beer Week. That’s it. Oh, we have meetings and we all have our tasks and chores to do so there is more to it than that. But at its core, it is “who knows who”, some e-mails and knowing who to talk to. 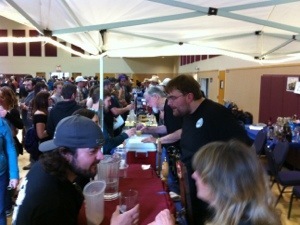 Humboldt Beer Week had its first effort in 2011. It had little planning behind it, about a month and mostly just a couple of people doing the work. I remember seeing the 2011 website after beer week had happened and not knowing anything about it until then. I said it before, and I’ll say it again; the first annual anything isn’t going to be this awesome mega-thing. Like everything else, it starts small and builds itself. Fast forward to April 2012. Saison Du Humboldt hits and I think it’s just about the coolest thing since malted barley. While interviewing Dylan Schatz, head brewer at Mad River, about the collaborative brew, he mentions maybe doing it again for Humboldt Beer Week. That, unfortunately, didn’t happen, but I diverted from the interview and asked Dylan who was it who was behind Beer Week. 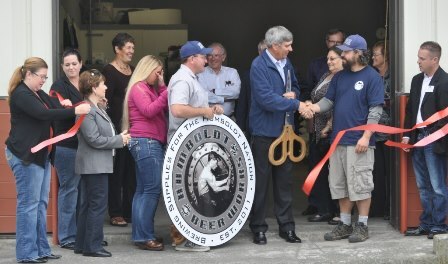 I had been trying to figure out who the brains was behind the project for a while, and Dylan gave me the name of Andy Ardell, proprietor of Humboldt Brews. I filed that away for future use. Fast forward again. At a midsummer meeting of the Humboldt Homebrewers, the upcoming Humboldt Beer Week was mentioned. 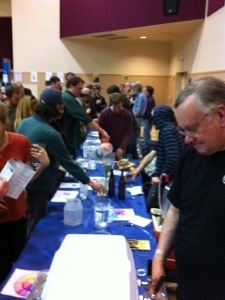 I was chosen as liaison to contact the Beer Week people and see how the homebrewers can be involved. I contacted Andy and told him I was interested in having the homebrewers be involved somehow in Beer Week. He told me that “we” were starting planning meetings soon and I was free to join them. “We” turned out to be mostly Andy and Victor “Vico” Hernandez and a couple other folks that have planned things with Andy in the past. 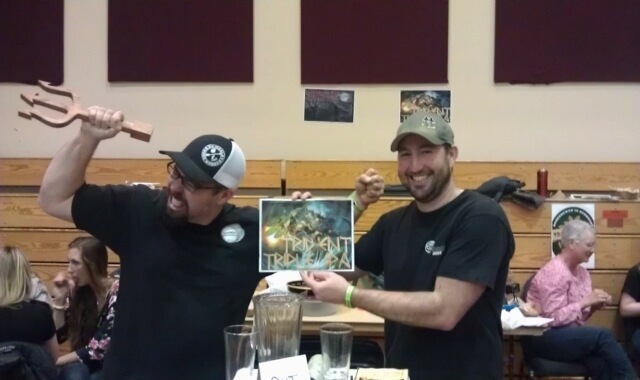 By the end of the meeting, I realized that I was no longer homebrewer liaison, I was a member of the planning committee. Up to this point — and I think I have mentioned it in this blog before — I have held a belief that Humboldt County is a craft beer destination, we just haven’t embraced the idea enough or utilized this asset in the way it can be. Take a look at the Mendocino/Sonoma craft beer scene. They own the mid west-coast title of craft beer destination. If one was on a brewery tour from San Diego to Seattle, Mendocino/Sonoma would be a natural midway stop. I think Humboldt can take that title away. And we need to. Humboldt cannot rely only on its natural beauty to bring in tourists and boost the economy. We must do things like this to sustain us. And Humboldt Beer Week is not so much about one small period in the year, but about bringing craft beer tourists here year round. So that idea plugged into Beer Week naturally. 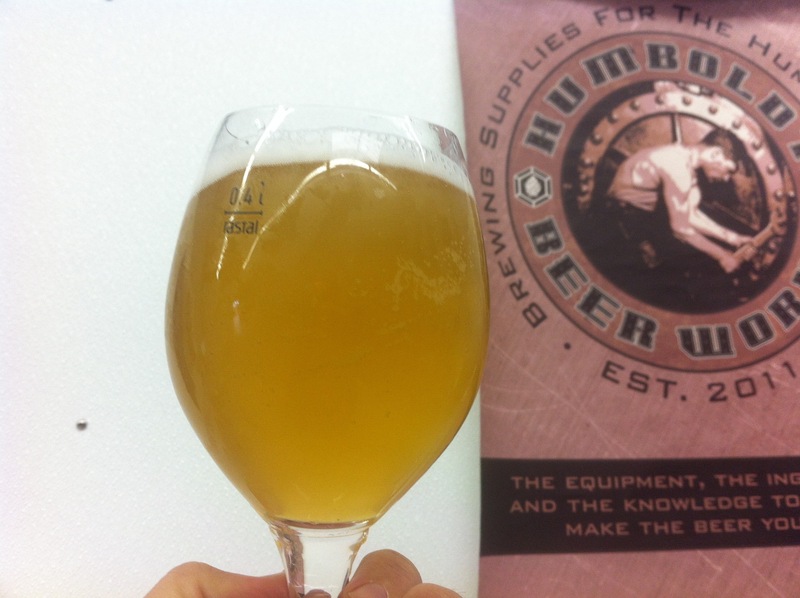 In a perfect world, there would be a “Humboldt Brewers Association” and Humboldt Beer Week would be their project. The brewers all do know each other and help each other out, but nothing on the official organization level. Hint, hint, wink, wink to all you pro-brewers in Humboldt. But that doesn’t exist, so a few of us on the outer circles took on the project. That first meeting was a whirlwind. 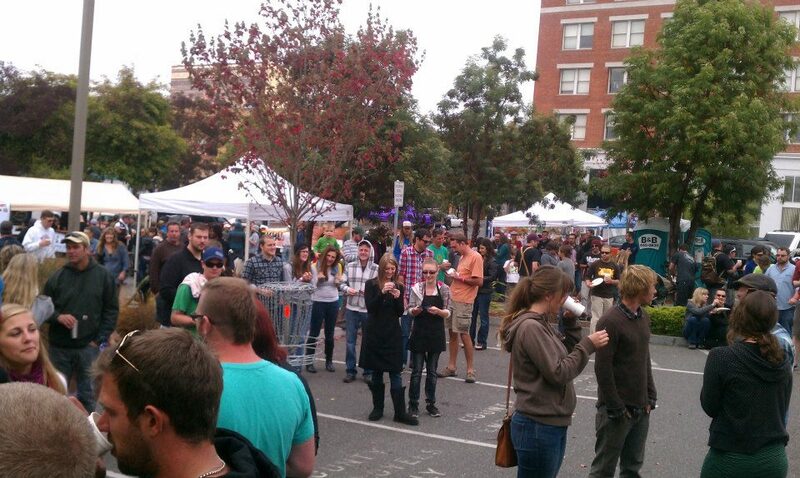 F Street Beer Fest was in its planning phases already but with a date two weeks prior to Beer Week. And that’s it. A group of people that know people. 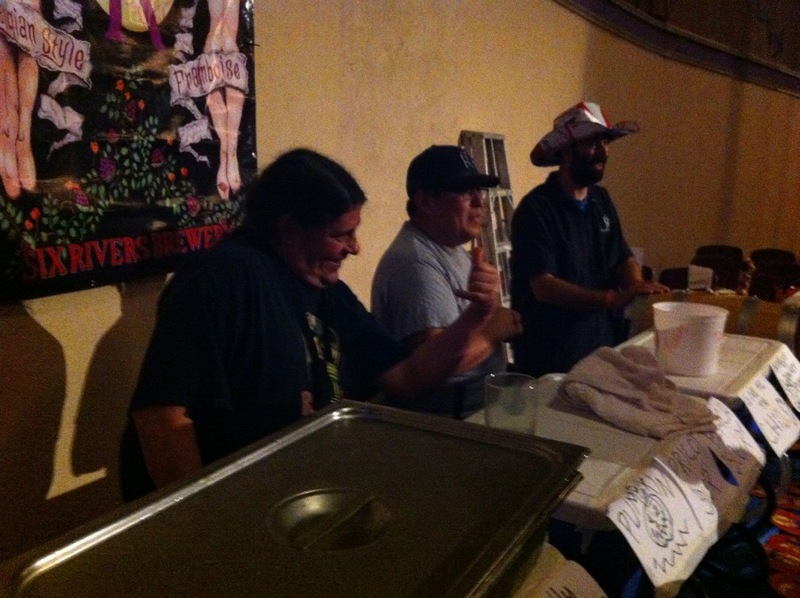 Then an entirely unplanned event happened that made Beer Week much more interesting –and stressful– for yours truly. Anyone who had been in Humboldt Beer Works knows one thing: its small. We had almost everything a homebrewer needed and we utilized every square inch of that place. It was always our goal to move within a year, and opportunity literally came knocking on our door in month 8. A property owner who had experience in selling homebrew supplies came to us and offered us a space he owned for rent. A much bigger space. We couldn’t pass it up. The only problem was the timing made the move on the cusp of beer week. But with crisis, comes opportunity. “Crisitunity”, Homer Simpson once claimed. 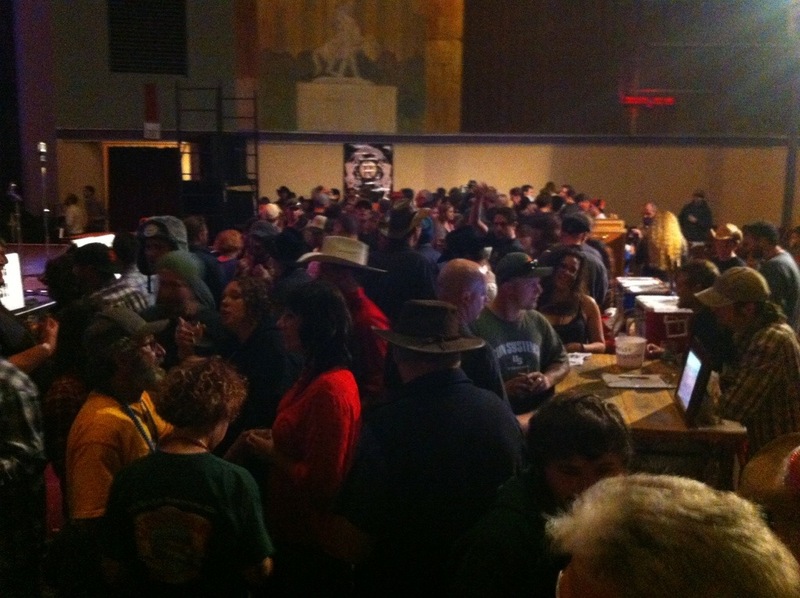 Suddenly, Humboldt Beer Works became part of Beer Week with three events. Due to my own doing, I actually participated very little in Beer Week. But business comes first sometimes. And we try to fit as much fun in our business as possible. Thursday, we hosted the Humboldt Homebrwers monthly meeting. It was probably one of the better, most well attended monthly meetings we have ever had. The next day, Friday, we had our ribbon cutting with the Eureka Chamber of Commerce. 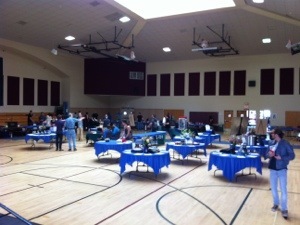 Saturday, we had our grand re-opening, but tied it into Arts Alive. 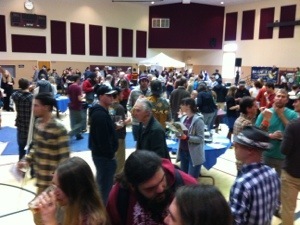 Humboldt Beer Week will happen again. And again and again. It will be back in 2013 bigger than ever, unless the world ends in December. I would like to thank Andy Ardell and Vico Hernandez for a great ride. And a raise of the glass and big thank you to Meredith and Talia at Six Rivers Brewery, Julie and Tera at Mad River Brewing Co., Drake at Redwood Curtain Brewing Company and Jere with Lagunitas for the Arts Alive donations. You guys and gals are the best. Over 200 different beers, 36 events, 9 days, 9 venues, 2 festivals. And one hell of a week.